First, install Nimble Streamer if you still haven't done that yet. 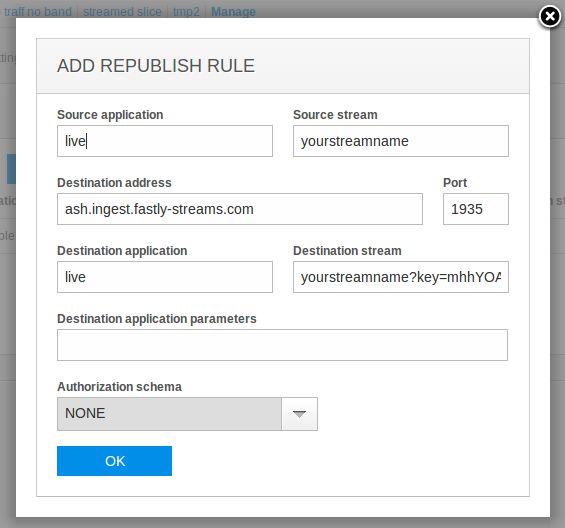 Now, define RTMP streaming as described in "RTMP republishing via Nimble Streamer" article. As a result you'll have incoming and outgoing streams for further processing. The specific step to set up Fastly streaming is the re-publishing setting. In the Live streams set up menu go to server details and its RTMP settings. There you need to choose Republishing rules tab to see the setup options. Click on Add button to get a setup dialog to set up republishing. 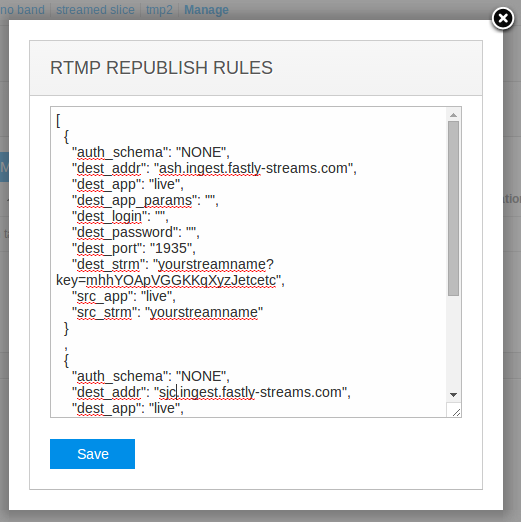 Setup dialog for publishing RTMP to Fastly CDN. The fields values will be as follows. The "Source application" and "Source Stream" are the app and the stream which you made as the Nimble Streamer output. Where "Destination address" will be the ingest point you selected in Fastly settings. "Destination application" is the name of Fastly live streaming application. "Destination stream" is your Fastly stream name with the stream key. Moving settings between the servers in your account - you just copy these line, go to next server settings and paste then there. Adding publishing settings for multiple streams. If you have dozens of streams, it's easier to work with text settings rather than clicking through the dialog boxes. Adding multiple Fastly ingestion points for robustness purposes. The latter cases, you can append similar settings separated by comma. RTMP publishing into multiple ingest points of Fastly CDN. Once the settings are saved, the stream will be published into the CDN and your viewers may enjoy the media. This is one of the cases where Nimble Streamer can handle live streaming scenarios. Learn more about Nimble live streaming and contact us if your streaming scenarios need any updates of described functionality.